Yes, it's gross, but sometimes it's necessary. There's a lot of software for Intel processors, and there's a lot of it that you can't recompile, so once in awhile you've got to get a little dirty to run what you need to. In prior articles we've used QEMU with KVMPPC to emulate virtual Power Macs and IBM pSeries, but this time around we'll exclusively use its TCG JITted software CPU emulation to run x86_64 programs and evaluate their performance on the Talos II. 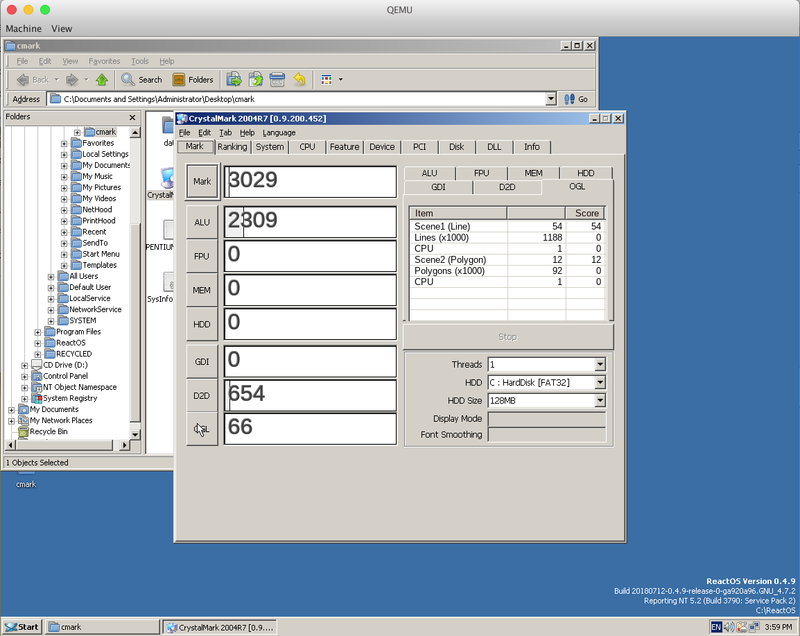 For this entry we will be using QEMU 3.0, compiled from source with gcc -O3 -mcpu=power9. Make sure you have built it with (at least) x86_64-linux-user,x86_64-softmmu in your --target-list for these examples, or if using your distro's package, you'll need the qemu-x86_64 and qemu-system-x86_64 binaries. However, there is also a new experimental fork of QEMU to try called HQEMU. HQEMU uses LLVM to further optimize the code generated by TCG in the background and can yield impressive performance benefits, and the latest version 2.5.2 now supports ppc64le as a host architecture. However, despite its obvious performance gains, HQEMU is not currently suitable as a total QEMU replacement: it's based on an older QEMU (2.5.x) that is missing some later features and improvements, it still has some (possibly ppc64le-specific) notable bugs, and because it needs a modified LLVM it currently has to be built from source. For this reason I recommend you have them both available and select the one that works best. It takes about 15 minutes to build LLVM and clang with make -j24. It takes a couple minutes for a build with make -j24. If you rebuild hqemu and you get a weird compile error while building some of the LLVM-related files, make sure that the llvm-config from the modified LLVM suite is first in your PATH (not the system one). 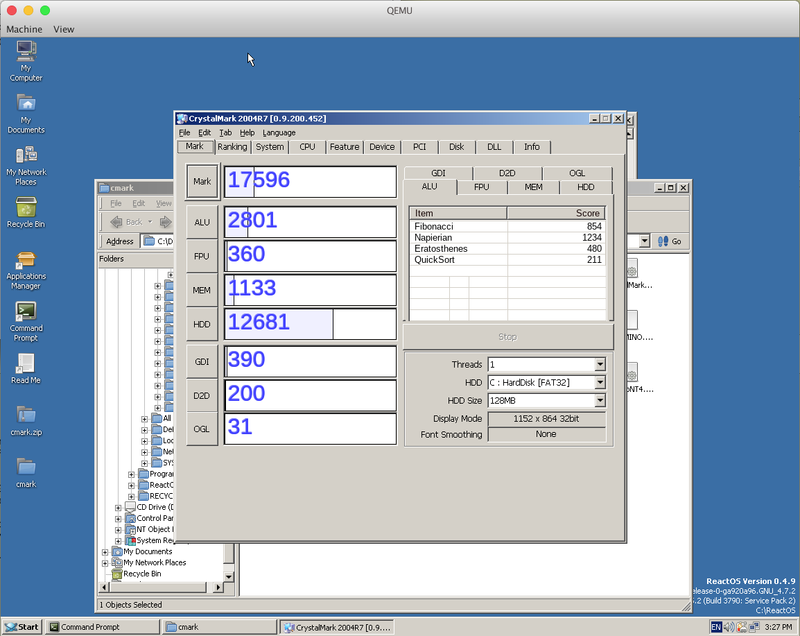 I'll include a couple screenshots of QEMU 3.0 and HQEMU 2.5.2 running a benchmark in ReactOS 0.4.9 under full system emulation here; you should be familiar with using QEMU by now, so I won't discuss its use further in this article. I used the CrystalMark benchmark not because it's particularly good but because most of the typical Windows benchmarking programs don't like ReactOS. First is QEMU, second is HQEMU. You'll notice there were some zeroes in the benchmark under HQEMU. That's because they made HQEMU segfault! Also, oddly, the ALU score was worse, but the D2D and OpenGL scores -- done purely in software -- were two to four times higher. Indeed, ReactOS is a lot more responsive under HQEMU assuming you don't do anything it doesn't like. If you need to run a Windows application on your T2 and HQEMU doesn't poop its pants while running it, it is a much faster option. Note that some or all of these numbers can improve if you have any VirtIO support in your OS and/or appropriate drivers, which I have intentionally not used here to demonstrate the worst case. You may also be able to use your local GPU with virgl. We might look into that in a future article to see how practical non-native gaming is. Next, increase the number of digits computed by changing the line 50k to 500k (i.e., 500 digits), and time that. Assuming those numbers look accurate, finally bump it to 1000 to get a less noisy test. I'll spare you the digits. Call it about 20 seconds of wall time natively (though I should note that Fedora 28 ppc64le is compiled for POWER8, not POWER9). Now, let's set up our x86_64 library root for the emulator test. Your distro may offer you these files in some fashion as a package, but I'll assume it doesn't and show you how to do this manually. Create a folder called debian-lib-x86_64. Our libraries will live here. Download the desired x86_64 (a.k.a. amd64) .deb of libc. I used the one from Jessie, but any later version should work. Uncompress it and find data.tar.xz within the .deb. Uncompress that. Within the data subfolder thus created, drill down to lib/x86_64-linux-gnu. Move that folder to debian-lib-x86_64/lib. Within debian-root/, create a symlink from lib to lib64 (i.e., ln -s lib lib64). If you did this correctly, you should have a debian-lib-x86_64/lib with a whole mess of files and symlinks in it, and a debian-lib-x86_64/lib64 that points to the same place. Any additional libraries you need can simply be thrown into debian-lib-x86_64/lib. Next, grab the x86_64/amd64 build of dc. I used the version from Buster since it matched the one on my Fedora 28 install, 1.07.1. It will work fine with the Jessie libs, at least as of this writing. Uncompress the .deb, find data.tar.xz, uncompress that, and find the dc binary within the created data folder. Move it somewhere convenient. For the examples in this article I saved it to ~/dc.amd64 and my x86_64 Debian libraries are in ~/src/debian-lib-x86_64. First, let's test with QEMU itself. This assumes your pi.dc script is still set to 1000k. This is about three times slower than native dc, which isn't as dismal as you might have expected because all the syscalls are native instead of being emulated as well. We already know HQEMU will do this faster, but it'll be interesting to see how much so. Yes, 172% CPU utilization because of HQEMU's background optimization threads, but wall clock time is only 27 seconds! That's "only" 35% higher! In this case, HQEMU is about three times slower than regular QEMU because of the LLVM optimization overhead over a very brief runtime. This example is still a nearly imperceptible seventeen hundredths of a second in wall clock terms, but if your workload consists of repeatedly running an alien architecture binary with a short execution time over and over, HQEMU will cost you more. Admittedly, I can't think of too many workloads in this category, but I'm sure there are some. The take-away from this is that if you have a Linux binary from an x86_64 system and you can collect all the needed libraries, it has an excellent chance of at least working, and if it's something HQEMU can run, working with a relatively low performance penalty. The trick, of course, is collecting all those libraries, which could be a quick trip to dependency hell, and messing around with binfmt for transparent execution is left as an exercise to the reader. Full system emulation still has a fair bit of overhead but it's easy to set up and generally liveable, even in pure TCG QEMU, so you can do what you need to if you have to. Now go take a shower and wash all that Intel off. "taking the arctangent of 1 radian"
As far as I know, the argument to atan is dimensionless, not in radians, so that should just be "taking the arctangent of 1". Nothing of consequence, just something that set off my math alarms. Really curious if you have tried pci pass through with something like vfio. I’ve been using it for years on my x86 system for my workstation guest (video card and usb 3 card) but I’m not sure how well my workstation be would run on this kind of hardware if at all. Its very tempting though and the talos ii board looks really good; looks very similar to a super micro board like my x10dri. Not yet. I want to see how well it does as a gamer and that should facilitate testing something like that. also I like how it looks like they did away with the x16 slot clips on the talos, those broke off on mine ;p overall I see a lot of good characteristics on the talos2 like the socketed boot and bmc flash chips. The diff of $2,000+ still isn't worth it to me though. later on I'll see if I can get my video card to pass through on a qemu-system-ppc64le guest and play around with that. I was playing around with it some yesterday trying to pass through a 10gbe nic without much luck but then again I couldn't get it to boot the debian installer discs I provided at all either. But, give me some time and I'll get back to you on that. Good spot. Just saw it myself. These 20.8 sec for "time dc ~/pi.dc" with 1000K is nativly on POWER9? Seems a little bit slow as it's the same time on my one decade old Athlon 7750.